3DS rhythm game due out on late May worldwide. 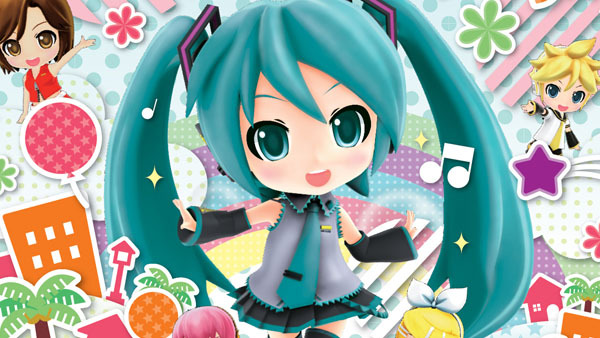 Hatsune Miku: Project Mirai DX will launch for 3DS at retail and via download in North America on May 26, in Japan and Korea on May 28, and in Europe on May 29, Sega announced. Pre-order details will be announced at a later date. The game, made in collaboration with Good Smile Company, features Hatsune Miku and her friends in their Nenoroid figure style. It features 48 full-length songs and multiple game modes and play styles, including “Touch Mode” and “Button Mode,” each with multiple difficulty levels and customization options. Players can adjust difficulty via challenge and support items, change timing indicators and target icons, and swap out vocals in certain songs. Additionally, players can watch their favorite videos with scrolling commentary in the “Mirai Theater,” create unique dance routines in “Dance Studio,” and compose their own song phrases in “My Tune.” Players can also share their own customizable “Player Cards” with the community over StreetPass and SpotPass.